As far as the performances were concerned, I cannot fault anyone. Michael Courtney (who directed the show and also starred) was a funny, charismatic host and very talented and versatile performer, pulling off a faultless rendition of the thrilling song ‘Gethsemane’ from Jesus Christ Superstar, followed almost instantly by an impressively sung ‘Bring Him Home’ which garnered a particularly long and well deserved applause. Meanwhile Gareth Gates was charming on stage, and his numbers were some of my favourite of the night. The supporting cast (Rosanne Priest, Kerry O’Dowd, Nichola Lagan) each performed a number of fabulous songs too, some highlights being ‘I Still Believe’ from Miss Saigon, and ‘Think of Me’ from The Phantom of The Opera. In fact, was impressed by the variety of songs performed. Although there were plenty of classics included in the set list, we were also treated to some songs from musicals which are lesser known to a wider audience. 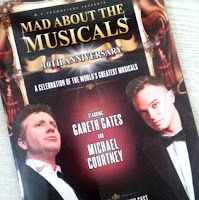 I was overjoyed when Michael Courtney and Gareth Gates dueted ‘You’re Nothing Without Me’ from one of my favourite musicals City of Angels. I also found it interesting that some songs which I personally would consider synonymous with certain musicals were omitted in favour of slightly lesser known ones. For example, Rosanne Priest’s Funny Girl number was ‘I Am The Greatest Star’ rather than the more widely recognisable ‘My Man’ or ‘Don’t Rain on My Parade’. I also applauded the decision to include a duet from the new musical Doctor Zhivago, which recently ran on Broadway. Although I didn’t personally love the song itself, it was an unexpected inclusion that really made me sit up and pay attention. For me though, the highlight of the evening was the Les Mis section at the end of the show, culminating in a rousing rendition of ‘Do You Hear The People Sing?'. I was shocked by how affecting the music was, even with a significantly smaller cast that in the show. While the song list and the performers themselves were first rate, I did think that some other elements of the show looked a little dated. The costumes which the women wore were lovely but not very modern looking, and looked a little out of place next to the men’s smart and fashionable suits. I also found the lighting a little bit more reminiscent of a disco than a concert, but these minor elements hardly affected my overall enjoyment of the show. Overall I found the whole evening very enjoyable. The songs were entertaining, the cast was enthusiastic and the audience appeared to be having a fantastic time. Not only that, but in comparison to the eye watering prices which some similar shows charge today, Mad About The Musicals was a very affordable night out. It is clear why such a great show is now in its 10th year, and given the opportunity I would definitely see it again when it next tours.